Constantine Samuel Rafinesque, naturalist and philologist, was born on October 22, 1783, in Galata, a suburb of Constantinople, to Francois G.A. and Madeleine (Schmaltz) Rafinesque. His father was a French merchant and his mother the daughter of a German merchant family long resident in the Levant. Rafinesque's family moved to France the year following his birth; during the turmoil of the French Revolution, the boy was sent to live with relatives in Tuscany. He was taught by tutors; his hopes of a university education in Switzerland were thwarted by the family's reduced income after his father died in Philadelphia in 1793, of yellow fever contracted during a commercial voyage to China. At age nineteen Rafinesque became an apprentice in the mercantile house of the Clifford Brothers in Philadelphia. During the next two years, he roamed the woods and fields from Pennsylvania to Virginia, making plant and animal collections and developing a wide correspondence with fellow naturalists. He returned to Europe in 1805 and spent the next decade in Sicily, where he was secretary to the U.S. consul. He carried on a lucrative international trade in commodities while exploring the island for plants and identifying fishes in the Palermo market that were scientifically unrecorded. During this time his first scientific books were published. Rafinesque fathered two children in Sicily but could not legally marry their mother, Josephine Vacarro, because he was a Protestant and she a Roman Catholic. On his return to the United States in 1815, he was shipwrecked on Long Island Sound, losing all his collections and unpublished manuscripts. He remained in America the rest of his life, becoming a naturalized citizen in 1832, and did not see his family again. Assisted by friends, he lived in New York until 1818, when he set off on a collecting trip down the Ohio River as far as Shawneetown, Illinois. During the trip he began the first comprehensive survey of the river's fish population ( Ichthyologia Ohiensis, 1820). He stayed eight days with John James Audubon in Henderson, Kentucky, and on his return to Philadelphia passed through Lexington, where his former employer, the merchant John D. Clifford, had settled. Clifford, a trustee of Transylvania University , arranged for Rafinesque to become professor of botany and natural science there. Rafinesque's years at Transylvania, 1819-26, though often troubled by quarrels with colleagues, were among his most productive. He published scientific names, both locally and in Europe, for thousands of plants and hundreds of animals. He became interested also in prehistoric Indian sites -- identifying 148 of them in Kentucky alone -- and in Indian languages, leading to his preservation of the Walam Olum, the epic of the migration of the Delaware Indians. At Transylvania he taught botany through the innovation of examining physical specimens and he tried, unsuccessfully, to found a botanical garden in conjunction with the university. When he returned to Philadelphia in the spring of 1826, he shipped ahead forty crates of specimens, which were the basis of his studies for the rest of his life. Rafinesque's remaining years in Philadelphia were sustained by a variety of means. He traded in specimens and books; he gave public lectures; he organized a workingmen's bank; he invented and marketed a nostrum for tuberculosis. With the patronage of the wealthy Charles Wetherill, he issued an astonishing array of books -- not only natural history works but also philosophical poetry and a linguistic study of Hebrew -- although they found few buyers. By Rafinesque's own count, he published 220 "works, pamphlets, essays, and tracts," yet he left as great a bulk in manuscript, most of which was sold as junk after his death. Best known for remarkable fecundity in devising scientific names -- 6,700 in botany alone -- Rafinesque also had some insight into a number of theoretical issues in biology that became important later: the impermanence of species, the significance of fossils in dating sedimentary geological strata, and such ecological considerations as plant geography and plant succession. Plea from Raf to send samples of plants to him to start the Botanic Garden at Transylvania. Includes a Catalogue of the Principle Trees Shrubs and Plants of Kentucky. and a List of the Useful Plants, Shrubs, and Trees either Medicinal, Tinctorial, or Economical wanted for the Botanic Garden of Transylvania. as well as an Alphabetical List of the Ornamental, Fragrant or Singular Plants Shrubs and Trees wanted by the Botanic Garden. for sale at the nursery of N. Longworth of Cincinnati, O. Includes handwritten notes by Rafinesque. 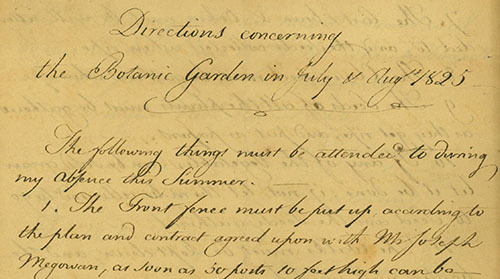 Hand written charter of the Botanic Garden. This is perhaps an agenda or a list of things to do.